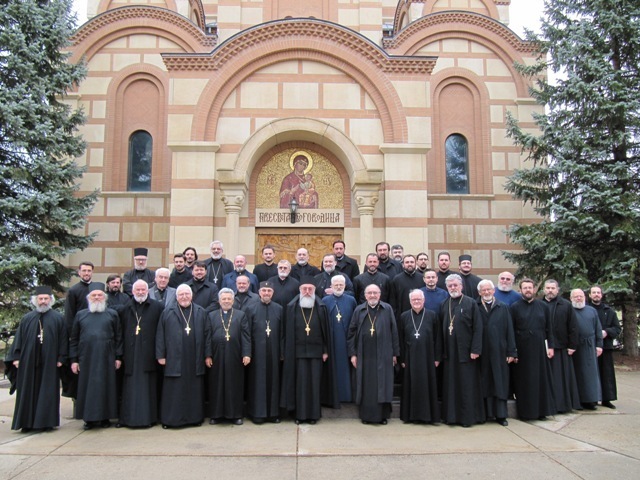 Grayslake, IL - The New Gracanica Midwestern Diocese held Annual Assembly on Friday and Saturday, April 8- 9, 2011 in the New Gracanica Monastery, the headquarter of the Diocese, under leadership of His Grace Longin, Diocesan Bishop. The clergy confession and subsequent conference preceded the Assembly. On Friday, April 8, 2011 the Liturgy of Presanctified Gifts was celebrated in the Monastery by the Deans of the Diocese: V. Rev. Petar Milosevich, V. Rev. Nedeljko Lunich, V. Rev. Bogdan Zjalich, V. Rev. Djuro Krosnjar and V. Rev. Zivan Urosev. After Holy Liturgy and a luncheon the clergy conference followed. V. Rev. Dr. Milos Vesin spoke on the theme “Eucharistic life of the Serbs in the 21st Century”. The discussion ensued regarding certain points of the presentation. The questions were ably answered by the lecturer. The Akathist to the All Holy Mother of God was served at 4 P.M., while at the same time registration was held in the Monastery Hall. After Invocation of the Holy Spirit a Lenten supper was served. The Assembly was convened at 7 P.M. with a prayer and blessing by His Grace Bishop Longin. His Grace presided at the Assembly, being assisted by the V. President of the Diocesan Council Milos Saravolatz and the Bishop’s Deputy V. Rev. Marko Todorovich. The minutes was taken by Deacon Nikolaj Kostur, assisted by the V. Rev. Milorad Loncar, Secretary of the Diocese. The Assembly followed the proposed and approved Agenda. The main items on Agenda were: Acceptance of the Agenda, the Minuets of the previous Agenda, Report of the Diocesan Bishop (is printed in entirety), Report of the Treasurer, Report of the Auditing Board, Acceptance of the Diocesan Budget, Recommendations of the Diocesan Council, Report of the Education Department, Report of the Youth Committee, Report of the Federation of the Serbian Sisters. The Assembly was held in a brotherly atmosphere, with due respect to each delegate, as well as giving full attention to each question, comment, proposal and motion. The report of the Treasurer was very detailed and all enhancing. The Treasurer Brane Brankov with his helper sub-deacon Paul, Diocesan book- keeper, were recognized for the excellent presentation and job well done. The reports of the Education Board, Kolo Sestara, Youth Committee, Auditing Committee were well received and the presenters were commended for the good work. The Assembly concluded its work on Saturday, April 9, 2011 at 1 P.M. with a prayer and thanksgiving for God’s great love and mercy. The Assembly issued a statement, printed in this issue of the Path.